1. Hypoxic conditions will be recognized in gene and protein levels to conduct maximum sensitivity, regulation capability and response speed. During our research, we identified two different systems which are able to sense oxygen depletion in the cell media. Hypoxia response elements (HRE), which work as transcription factor binding domains when inserted before a promoter sequence, is chosen to be used as a hypoxia sensing unit in gene level. For detailed information how it works, proceed here. Oxygen dependent degradation domain (ODD Domain) is a peptide sequence which prolyl hydroxylase adds hydroxyl subgroups in order to target it for proteasome when oxygen presence is enough for the cell. In hypoxic conditions, this targeting mechanism does not work; therefore the protein and adjusted components can survive inside the cell media. We aimed to take this feature for granted in order to use it as our protein level hypoxia sensor. For specific information; visit here. We desire to measure the sensitivity of these designed features and their response capacity. High response capacity means high regulation capability which is also an important issue in our project we hope to reach once the experiments have been completed. 2. Clot dissolving protein will be a potent element which can be secreted efficiently. According to our research, the most potent and effective clot dissolving agent is human tissue plasminogen activator protein(tPA). This protein is also used in clinical approach for the treatment of thrombi and emboli. tPA is a natural protease which enables the activation of plasmin, another powerful protease that degrades the main compound of clot particles, fibrin. tPA is also the main regulator of thrombolysis, the second cascade of balance between clotting and clot dissolving pathways . We aim to produce this protein with our modified vessel cells in response to hypoxia hence the cause of hypoxia is a clot. tPA sequence includes a self-secretion signal peptide which enables an effective excretion from the cell cytoplasm. Therefore, an additional design of a signal peptide is not required. 3. Antioxidant factors will build up before oxidative stress occurs in response to hypoxia and ROS presence. The cell itself normally produces reactive oxygen species, free radicals in minimal amounts. These compounds are in balance with naturally occurring antioxidants and enzymes. We selected two enzymes which are able to catalyze two related reactions, hence resulting in the detoxification of ROS into water and oxygen. Superoxide dismutase(SOD) and glutathion peroxidase(GPX) are planned to accumulate in the cytoplasm. An additional protein we found in literature is aprotinin. This protein inhibits a common pathway which produces ROS and therefore will be used to further prevent the production of radicals. These proteins are planned to be adjusted with hypoxia response elements mentioned above as well as the ROS inducible promoter also which will be explained next. 4. ROS presence will be sensed effectively in the transcription level. Once the hypoxia causing clot has been removed, the production of the proteins mentioned above will be expected to decrease, leading to insufficient protection from ROS damage. We plan to compensate this by introducing a second sensor promoter which can be activated by ROS presence. Nuclear factor kappa B (NF-κB) respond element has been selected to use for this objective. 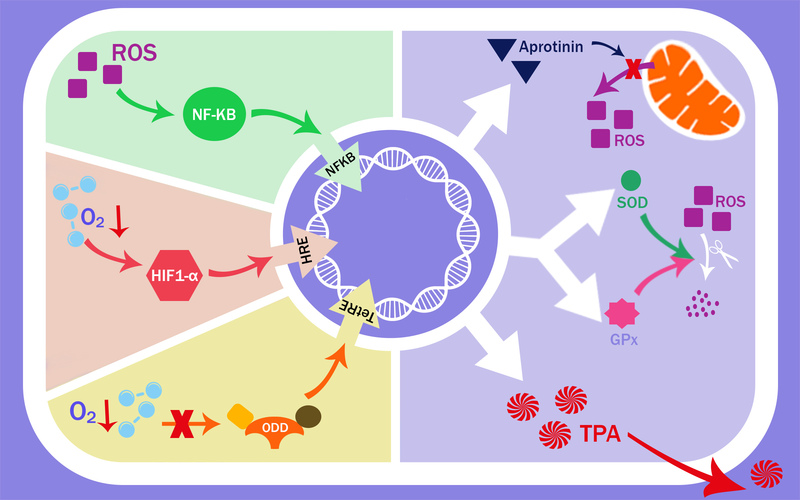 Detailed information about NF-κB is here.